Do you believe that you can have a perfect marriage? Who are you looking for to be your lifelong partner? Whose hand will you hold in your hand? In the US, according to statistics, 50% of marriages end up in divorce. Despite advancement in technology and science, the subject of marriage and love seems to be as confusing as ever. News of affairs, divorces, separations fill up magazine and tabloids front pages. Families break apart and marriage becomes a 'disposable' item like the plastic utensils one throws away after use. 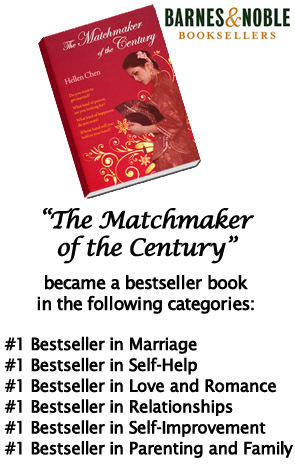 Hellen Chen's "The Matchmaker of the Century" takes on the subject of marriage in a tough modern world. Having had her own journey of transformation, she now counsels men and women on how to gear themselves up for marriages in current society and make it last. Bestselling Author Hellen Chen and Matchmaker was invited on TV Show San Diego Living in California to talk about what is a perfect match and why dating is a waste of time. Hellen also addresses the topic of finance in a relationship and whether money is needed for having a loving relationship.